Years of after holiday sales and a little hot glue make for a festive table! 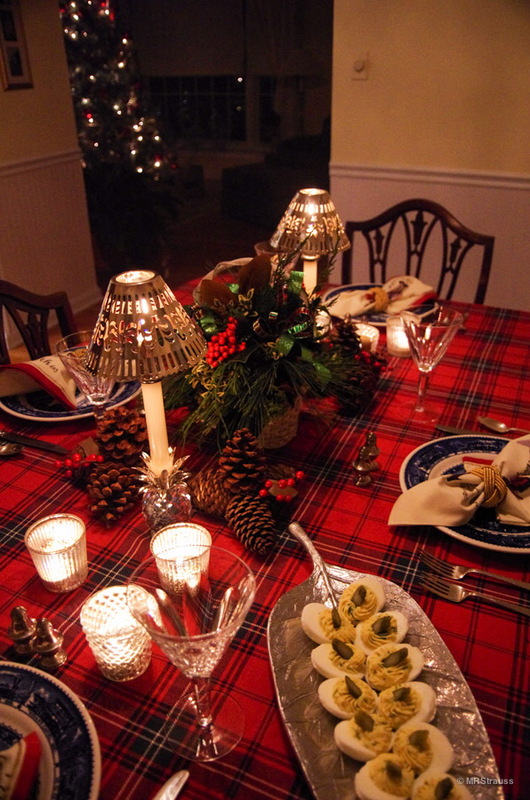 Plaid table cloth, 12 Days of Christmas napkins, and napkin rings from Williams Sonoma. Leaf plate from Martha Stewart for Macy’s. Votive candle holders from Pottery Barn. Wine glasses from Waterford Crystal. Candle shades from Harrod’s London. Centerpiece by Debbie Van Lunen. Pine cones from around the neighborhood. This entry was posted in Inspired and tagged Christmas, Christmas Eve Dinner, Debbie Van Lunen, Harrods, Martha Stewart for Macy's, Pottery Barn, Waterford Crystal, Williams Sonoma on December 17, 2017 by mrstrauss.